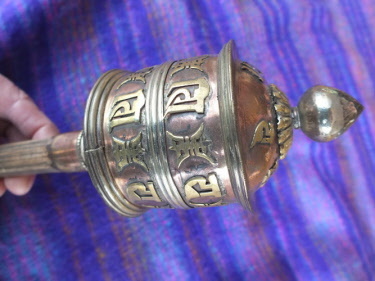 Beautiful Tibetan Buddhist Prayer wheels. 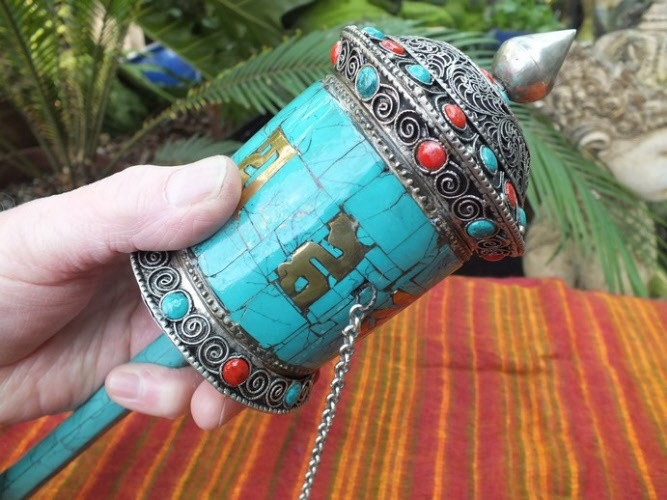 Some highly decorated with Turquoise and Red Coral. 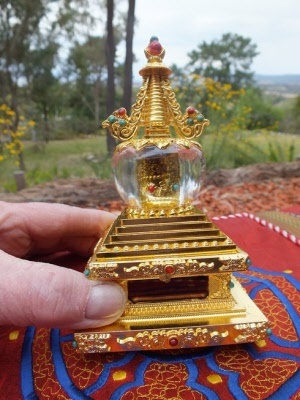 Miniature to large size available. This beautiful Prayer Wheel has the Mantra around the outside of the barrel as well as inside the barrel on paper. 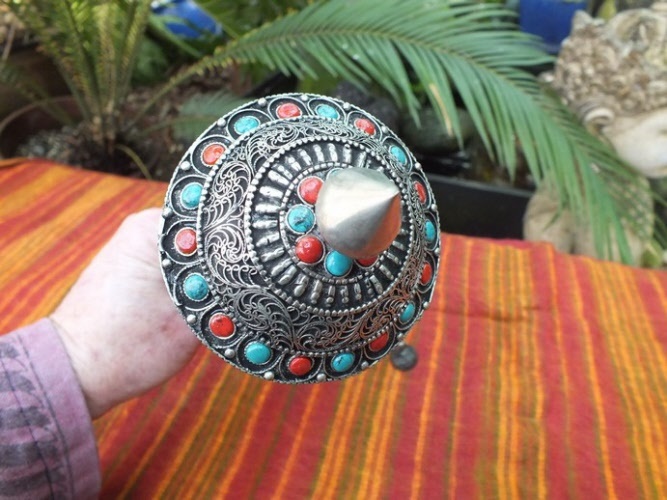 This one also has Turquoise and Coral stones on the outside and top. 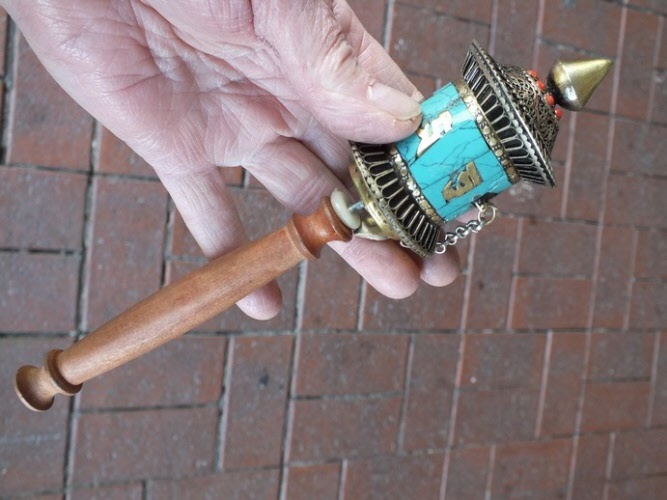 Just hold the handle and spin clockwise gently, let the weight on the chain spin it for you. 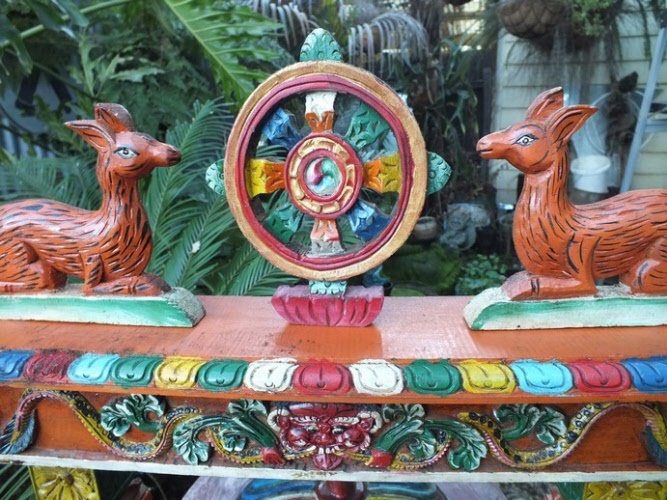 Click the photo for more detail and photos. A beautiful Prayer wheel set, you can place it on a table or your Altar, spin the wheels. 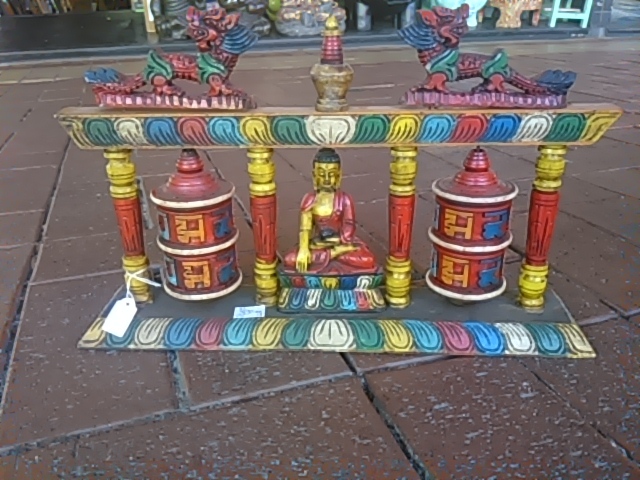 Hand made and painted in traditional Tibetan Buddhist colours. 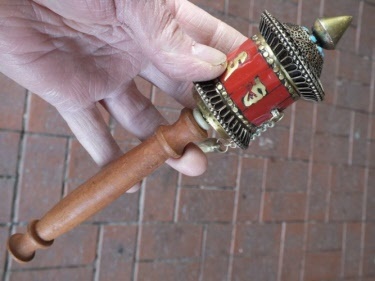 Made from wood. 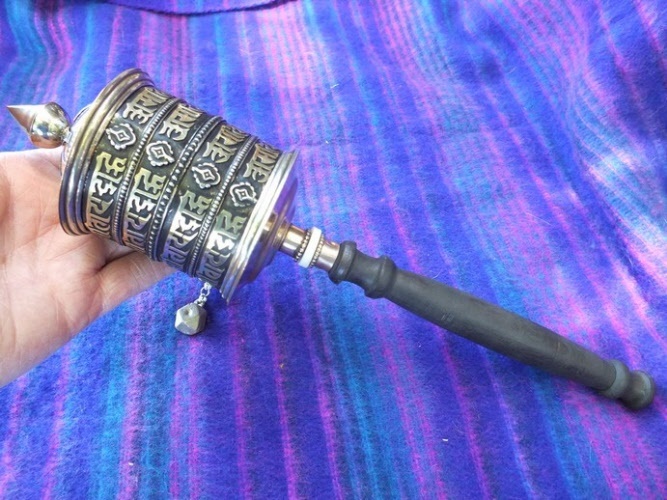 Made in Nepal and comes with wooden handle, the outer is made from copper and brass. 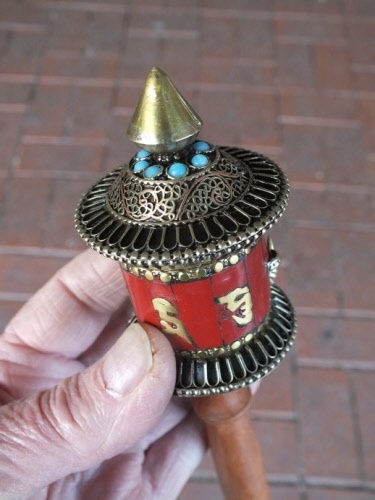 Just hold gently with your fingers and spin clockwise to send your Prayers to the heavens. Om Mani Pade Hum Mantra written on paper rolled inside the Prayer Wheel barrel. 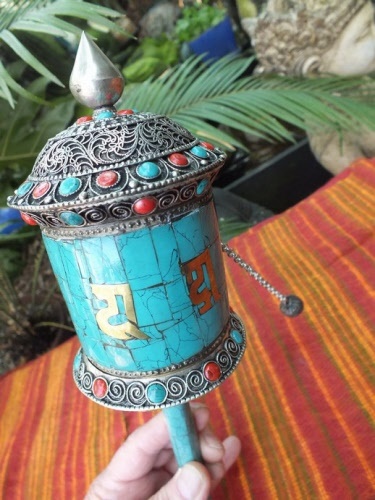 Beautiful Solar Powered Prayer Wheel. 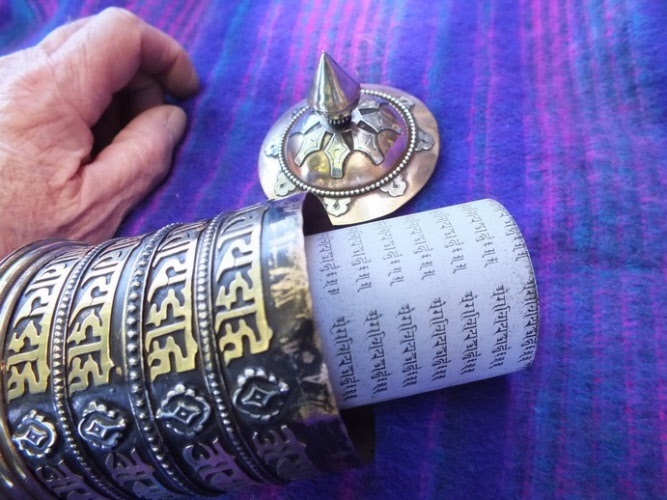 Has prayers printed on paper inside just the same as all of our other Prayer Wheels. 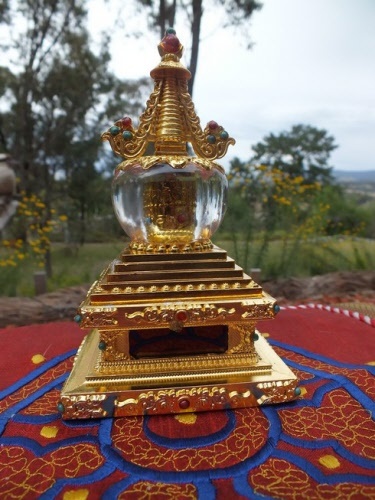 Designs and packaging may vary due to changes in stock. 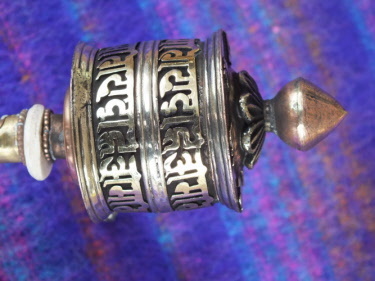 A beautiful example of Nepalese workmanship. 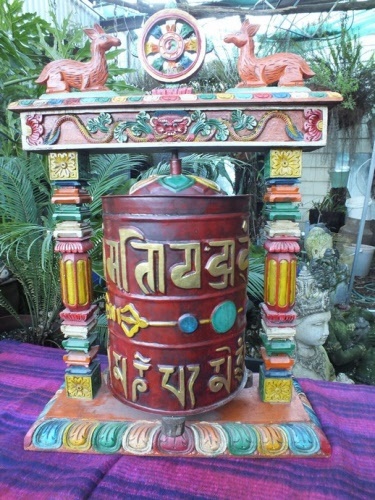 This is a fantastic extra large Prayer Wheel, made from wood with metal barrel in centre. Ideal for your Temple or Home Shrine, a local Buddhist Group as well or just someone who likes collecting Buddhist items. 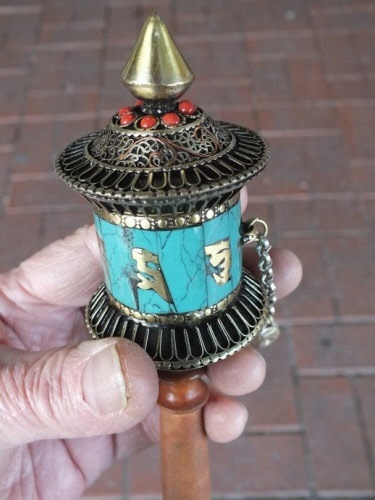 Truly beautiful, this hand held Tibetan Buddhist Prayer Wheel is covered in Turquoise and Coral tiles. 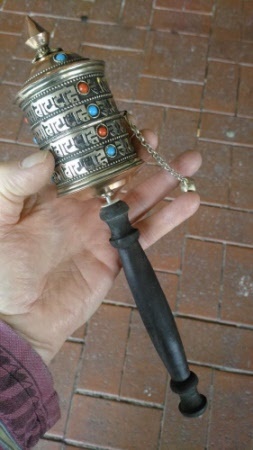 It's made from Copper and Brass and has the Mantra around the outside. 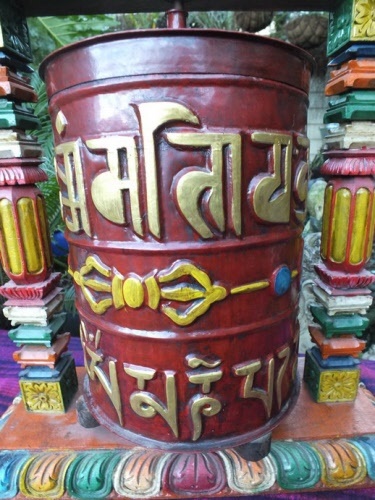 The Om Mani Pade Hum mantra is printed on paper and rolled inside the barrel. 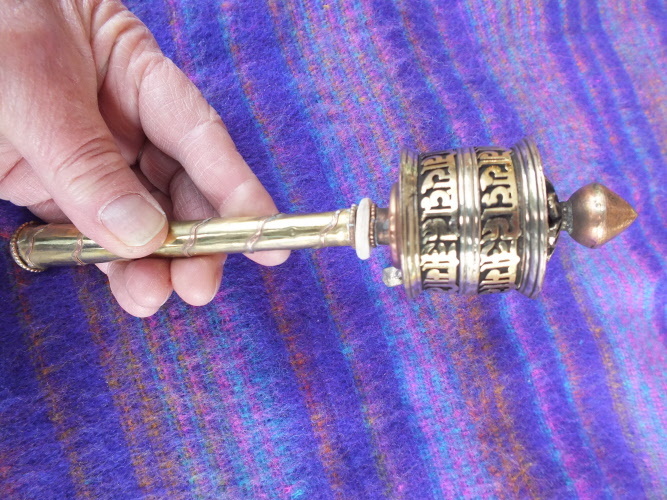 All you need to do is slowly spin the Prayer Wheel in a clockwise direction and your'e sending off your prayers. 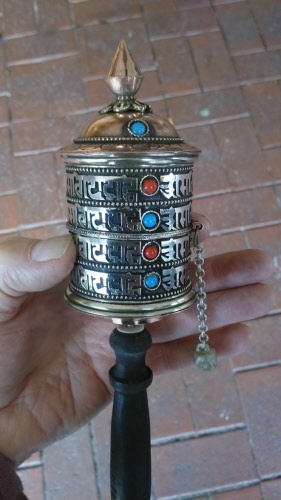 A fantastic gift for the person who has everything, or the Buddhist in your family or circle of friends. Measures: 33 cm long (including handle) x 8 cms wide. Beautiful Stupa, as pictured has battery operated prayer wheel inside. Made by Buddhist practitioners in Nepal. 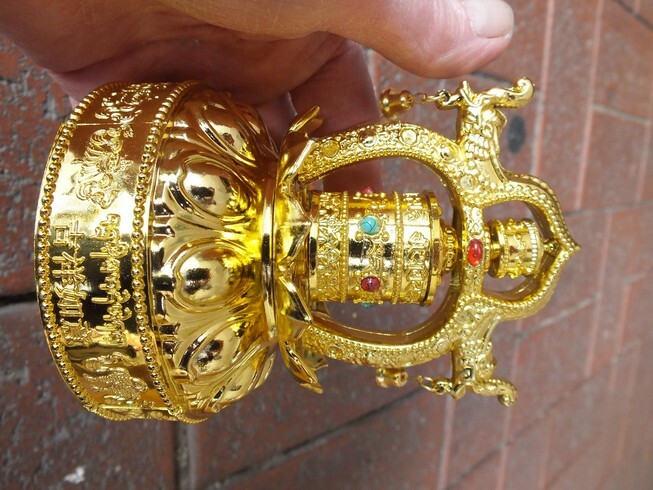 A product of real beauty. 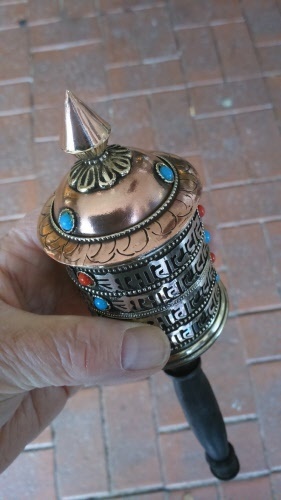 Beautiful design this brass and copper Prayer Wheel has the Prayers written on paper inside the barrel. 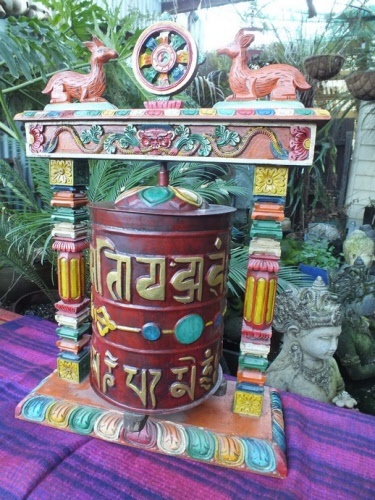 Lovely Mantra inscribed on outside of barrel also / and has a great spinning action. 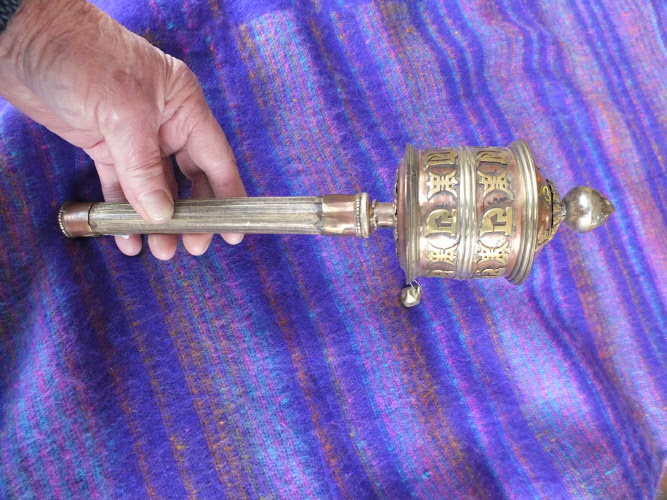 Crafted in Nepal from copper and brass with a wood handle. 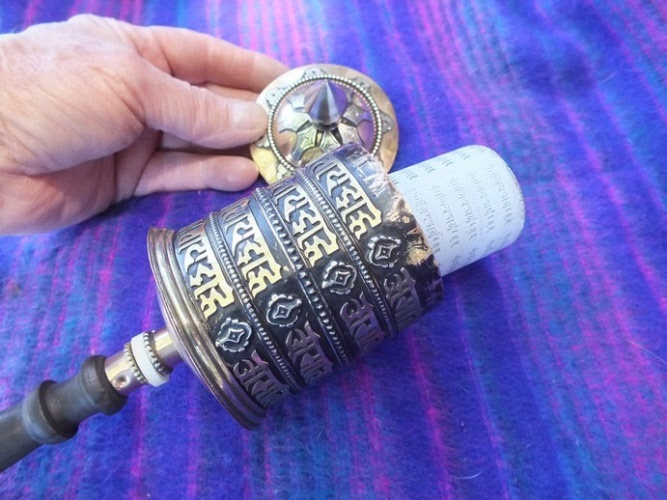 Has Prayers printed on paper inside like all Prayer Wheels should. 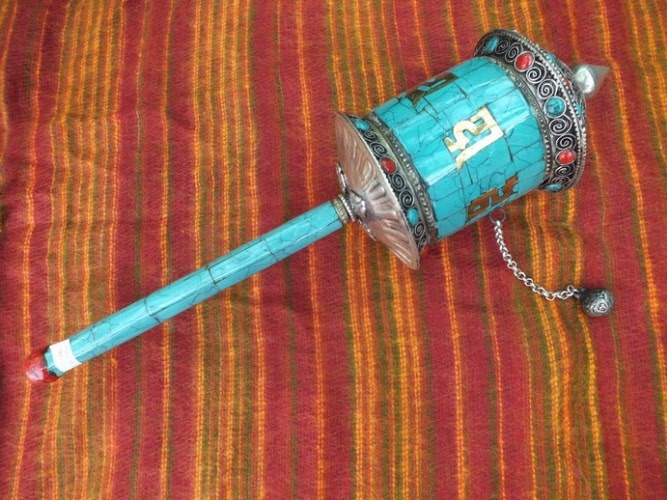 Just hold in your hand and start spinning clockwise and send your Prayers to the heavens. 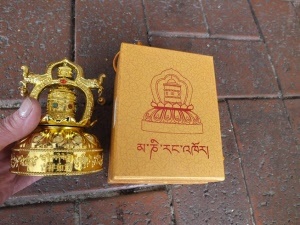 As used by Tibetan Buddhists worldwide. 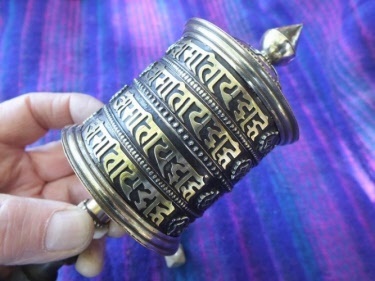 Made from copper and brass with prayers printed on paper roll inside the barrel section. 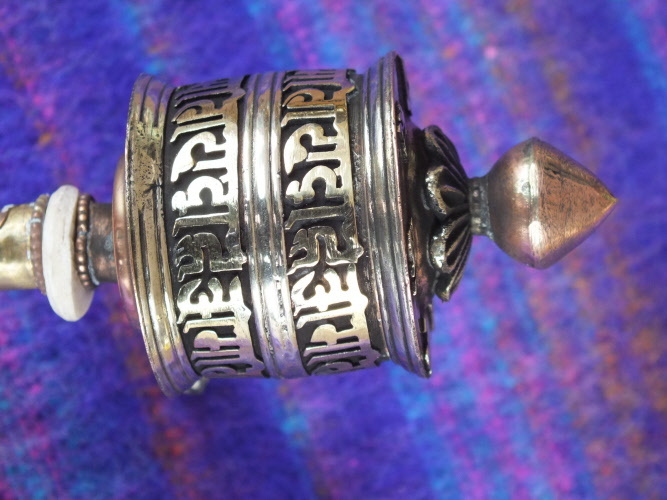 Just spin in a clockwise direction and start sending your prayers, concentrated your mind on the Mantra. 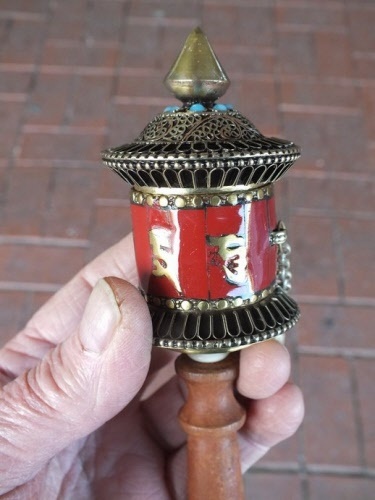 Great Prayer Wheel with turquoise chips around outside and red coral on top. 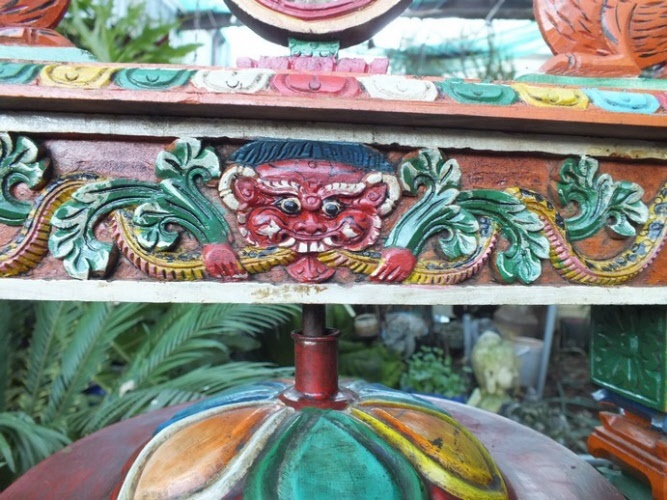 Click photo to see more detail.